Michael Kors Bradshaw MK5739 to niesamowicie interesujący zegarek damski. Materiał, z którego wykonana jest koperta to pozłacana PVD, co świadczy o wysokiej jakości produktu, natomiast tarcza nadaje zegarkowi charakteru przez swój wyjątkowy czarny kolor. Zegarek wyposażony jest, między innymi, w chronograf (stoper) i funkcję daty. Jeżeli chodzi o wodoszczelność, zegarek jest odporny do 100 metrów. Oznacza to iż jest zbudowany z myślą o pływaniu i pytkim nurkowaniu. Zegarek jest wysyłany z 2-letnią grawancją i oryginalnym opakowaniem od producenta. Great service, loved the product. Looks even better now its on my wrist! I had been looking for a black/gold watch which would be as decorative as a bracelet. This year that colourway seems to be in the minority as rose gold has largely taken over! I came across this one after looking for quite some time. I like the large face, metal bracelet, the gold is nice and muted not garish/cheap looking and its features which are both robust and attractive at the same time. Others I looked at including Vivienne Westwood lovely designs were smaller and had leather bracelets. The weight of this is noticeable when you get it out of the box, yet I quickly became used to it. I will need to take about 4 links out as I have slim wrists but that will still give me the loose bracelet effect and I intend to wear it when travelling for work or on nights out. The extra features - date, chronograph are interesting and I guess will be useful to some: I did not buy it for that, though these features are easy to use. Importantly, it is easy to tell the time at a glance. So many watches are so concerned with extra detailing and a funky design that the original purpose is lost. Very happy with this watch. 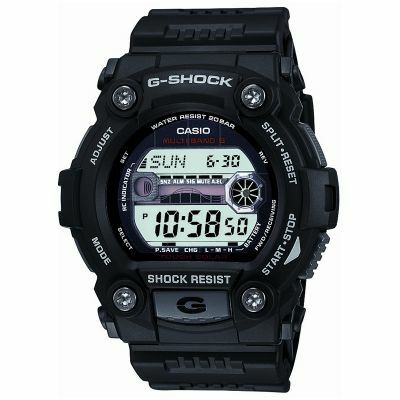 Beautiful watch I bought for my self is nice and very eye catching was so happy when I received it cant wait to rock it. Love this watch,especially the roman numerals on the black facing.Friends have commented on how nice it looks. Love my wrist watch and is very bold. You just cant go wrong with anything from MK, he simply knows how to make a statement. I have 3 MK watches and this watch is one of my favorites. I just love its look! It’s a stunning and altogether classy timepiece. Its bold and large yet elegant. An eye catcher! I believe this to be a unisex watch meaning it can be worn by a man or woman. Being a bit oversized, I wasnt sure if this would work for me because I have a small wrist however once sized and matched with a few bangles to keep it feminine it definitely works for me. Very nice fit and not too heavy. It has a very classic look with the roman numerals for the even numbers. Not only is it beautiful but it goes with just about everything! It has a rich look and can be worn dressy or casual. The gold-tone bracelet complement every outfit and you can wear this watch all season long. It also looks lovely with simple classy accessories. I love the black face and big numbers - the black face makes it pop against the gold tone. And it is more beautiful in person - the gold color is richer in person and compliments the style, and it definitely looks fancier. Awesome price for the quality. Don’t debate, it’s a must have! It goes with everything, it’s classy and looks great in person! 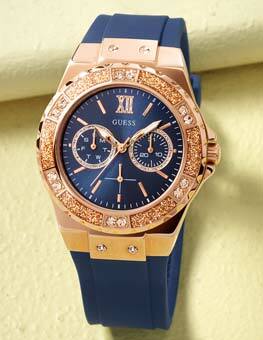 this is a very nice watch with a good quality, Very fast delivery. I am usually fond of writing reviews for the products purchased online and never ended up writing one and this one I cannot resist myself from doing so. And the watch which I bought seriously deserves a detailed review and hence I pen down mine. On arrival of my watch, which is Michael Kors MK5739 Chronograph, I was completely awestruck on seeing its beauty in person. When it comes to watches I am too choosy since I am a watch addict myself and I have lots of watches in my collection which is ever growing. Now without further due, let’s get into the review. Usually Michael Kors watches come in a beautiful chocolate brown colour hard cardboard type box and I was also expecting the same. But to my surprise my watch came in a pearl white colour hard box which was even more beautiful. On top of the box the brand name was embossed in silver colour which was totally appealing to the eyes. Inside the box, the watch was perfectly mounted on a grey colour soft pillow. It was very evident that the watch was brand new with the tag attached and the dial and bracelet covered with a plastic film which protected the watch from scratches during transit. The presentation box is so beautiful that you can consider gifting this watch to someone special. Just gift wrap it and you are good to go. It also comes with Watchshop guarantee. This particular Michael Kors watch MK5739 has a water resistance of up to 100M which is quite appreciable for a designer watch, one can pretty much use this watch even while swimming. It can also withstand shower, which is an added advantage for those persons who likes to wear a watch on their wrist 24 X7. On a caution note the watch crown should always be in closed position while coming in contact with water. Here comes the important part of the review which designer watch lovers are concerned of, that is the look of the watch. The watch looks extremely beautiful with a broad gold plated bracelet along with a totally contrasting black dial and this contrast in the dial makes the watch elegant. The center part of the bracelet is in matte finish or in other words it is brushed finish and the two sides of the bracelet is polished and shiny gold. This combination makes the watch looks subtle without overpowering of gold. The dial markers are in Roman Numerals and the indices are in gold colour & the crown is inscribed beautifully by the Logo MK. The water resistance and the model number are mentioned in the case back for our reference. To be precise this watch screams class in its very first look & it’s a total eye catcher or a conversation starter, in simple terms this watch looks bold & beautiful. I had to remove four links from the bracelet to get a perfect fit for my wrist, since the dial is on the bigger side this watch is not for someone who loves compact dial. But for anyone who is into boyfriend style watches this is a must buy. It goes pretty much with all the outfits & it can be worn both for casual and formal attire. 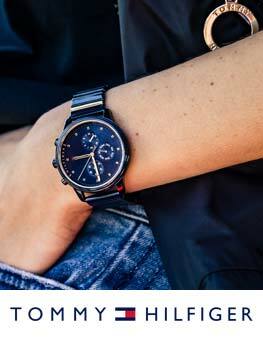 This watch uplifts any simple outfits because of its size and finish. It has got a substantial weight to it which tells about its superior quality, but this weight is not overpowering and you will get used once you start wearing it on a regular basis. This watch comes with one of the most important functionality of date display. The Aperture, i.e., a small window which lies in the 6’ o clock position displays the date. The crown can be pulled out in two positions, when you pull out the crown in the first position the date can be adjusted, and when you pull out the crown in the second position time can be adjusted which is pretty much standard across all watches. Apart from this there are three sub dials in the watch, each one performing the different function. 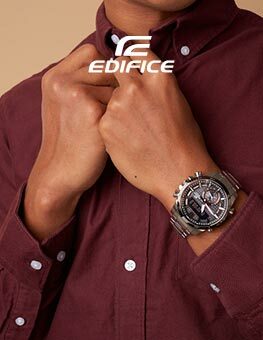 Now coming to the most important added functionality of the watch, which is chronograph. For those who do not know what a chronograph is, it is basically a stopwatch in simple terms. A basic chronograph has an independent sweep second hand which can be started, stopped and returned to Zero by successive pressure on the stem. Let me explain the chronograph functionality hoping it would help someone in need of. The Sub dial which is placed between 4’o clock and 7’o clock position shows the seconds. There are two pusher, one located above the crown and the other located below the crown which controls the chronograph of the watch. The pusher located on the 2’ o clock position is used to start chronograph and when it is pressed again the chronograph stops. The pusher located at the 4’o clock position is used to bring the chronograph back to Zero. The Sub dial which is placed between 8’o clock and 10’o clock position counts the minutes associated with the chronograph. Once it’s started the minute hands in this sub dial ticks consequently to the advancements of seconds in the other sub dial. In other words both these sub dials works hand in hand. Upon pushing the pusher at the 4’o clock position,, it not only set the sub dial showing the seconds goes to Zero, but also the minute hands will be reset to Zero. On the whole this chronograph functionality will be much useful for someone who wants to measure time as it shows the elapsed time also. This watch is with me for the past four weeks and I have been consistently monitoring its performance with regards to time keeping. I would say it performs brilliantly. It has neither lost nor gained seconds as of now. Since stainless steel is known for its inability to tamper and for its incredible polished finish, it is used by many leading watch makers including my favourite brand MK. I would say the stainless steel bracelet of this watch is quite resistant to scratches. But that is not a problem for me since I take utmost care to maintain all my watches in pristine condition. The fold over deployment closure shuts so well, that you need not worry about falling it out of the hand unnoticed because of it being loose. The chronograph function also performs so well. The marker & the indices in the dial are golden colour which is in contrast with the black dial, has a nice glow and shine to it which does not make it difficult to read the time in dim light. Overall the performance of this watch is so much appreciable. 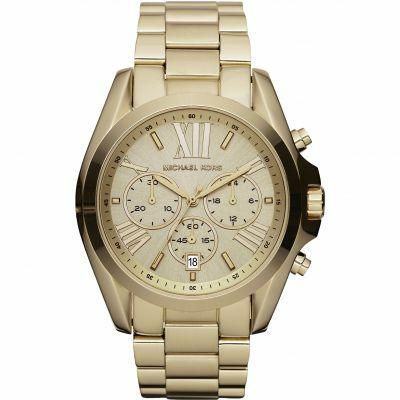 Before buying this Model MK5739 of Michael Kors, I had yet another option and had a tough time deciding between the two. The other one which comes very close to this model is MK5605 which comes under the same series Bradshaw. The only difference between this watch and the one I bought is the dial of MK5605 is champagne gold in colour, which also looks pretty beautiful and more feminine. But I personally liked the pop that came from the black dial and hence I opted for MK5739 and it looks more versatile too which is an unique feature of the model, rest all features are more or less same in both the models. It’s high time I mention the service I received from Watchshop which is noteworthy in this forum. I ordered the watch at the very last minute of the offer and it still got qualified for free next day delivery!! As promised on the website, the new MK5739 was on my wrist the very next day, needless to say I was over the moon. This is not my first order with Watchshop, as I had previously purchased a TISSOT watch last year. I am totally happy to receive this gorgeous watch as a gift from my dearest hubby for our upcoming wedding Anniversary and yes, I would definitely recommend this watch to any fashion conscious women who would like to invest in a classic timepiece with a reputed brand. The dial is a tad big on my wrist but I absolutely love the colour and the style of this watch so Im still keeping it. Fast delivery and excellent service! Very happy with the purchase! Purchased watch fro daughter xmas present and se actually loves it. Good quality and the shop altered the links for her free of charge which was a nice gesture. Will de3finitely use Watchshop again for future purchases. A beautiful purchase and great value. It got a great smile on Christmas morning!!!! Thank you so much. Its a perfect goldnot very shinycolour with a black dial.I like the broad chain bracelet.Very elegant.Overall its a perfect gift for me . 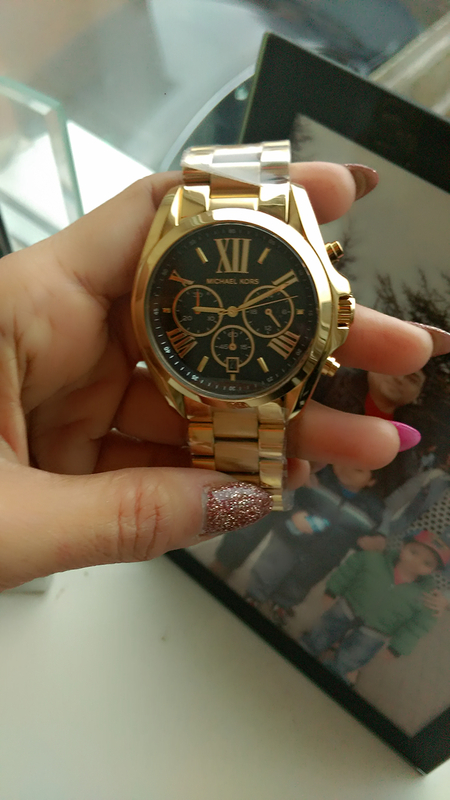 Absolutely love this watch its my 4th Michael Kors and I absolutely love it. Fantastic price too. Brilliant delivery too had it the next day. 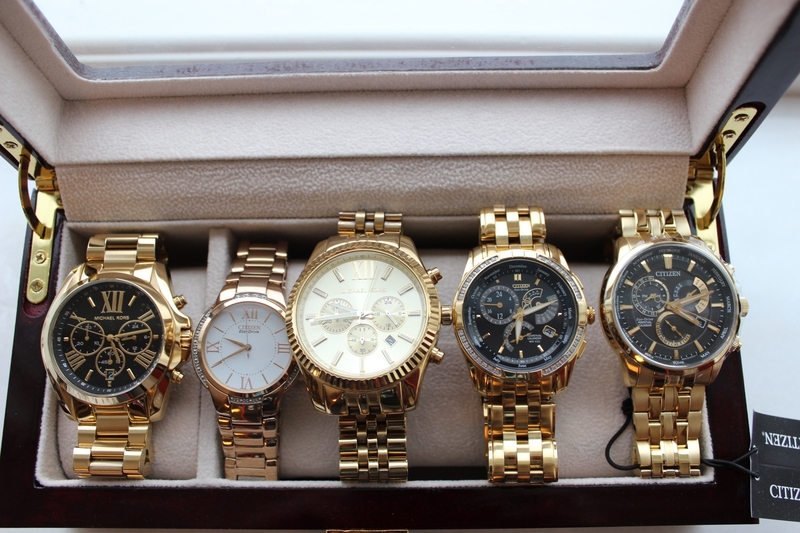 Ive spent some time trying to find the perfect gold watch, my others are either silver or black. I absolutely adored this watch the second I saw it and was not disappointed upon delivery.\r\nI like to have large watches even though I have very small wrists I always need at least 4 links removed!. This really is a statement piece of jewellery that attracts a lot of attention and most importantly, compliments.\r\nIf you prefer a more subtle look from your watches, this may not be the watch for you.\r\n\r\nIf like me, you have never worn a gold watch before, you may be apprehensive with the gold tone as they can differ amongst different brands. The centre links have a matt finish, whilst the outer section has a nice shine, as does the gold around the watch face. 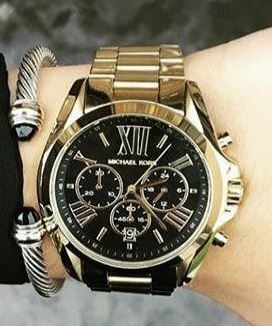 I think the black face really sets off the black beautifully and makes the dials and numbers pop.\r\n\r\nI have never owned a Michael Kors watch before. The presentation box is simple and stylish. It comes with a small but easy to read instruction/warranty booklet.\r\nI have found setting the time and date extremely easy, simply pull out the middle wheel - once for date, twice for time - you will feel/hear when you have reached these points.\r\nThe only downside is I went a day too far for the date, and you cannot wind back so had to go all the way through the month to reach the date I wanted. 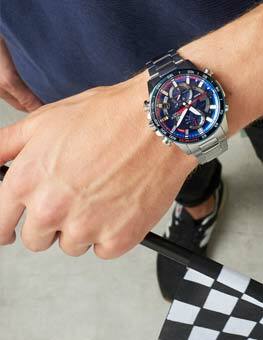 A very small bad point though in my opinion and obviously not something I run the risk of happening again anytime soon!\r\n\r\nOverall conclusion, an extremely attractive statement watch that feel extremely comfortable to wear. OMG what an wacth! I have bought this wacth for my daughters birthday she loves it so much.. it big/ it stylish.. just perfect ..thinking to buy this watch go ahead with no regrets coz I did!! I love the watch. The price was excellent aswell better then in shops in my town. I am used to buying a Christmas present for my wife and she always returns it and buys something nicer as I have bad taste I guess! Well this year I bought her a Michael Kors watch and she is keeping it. I have been looking for the perfect gold watch and this is it! Its larger than my previous MK watch but I love that. It stands out, I wear it as an everyday watch and its lovely for a special occasion too!